Great training week for me. There has been an unusual amount of sun here in Port Angeles the last few days. 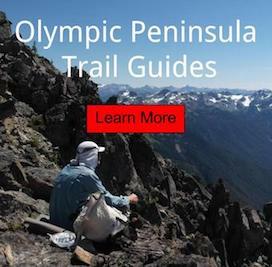 Perfect chance to get into the mountains, coast and on the trail. That now has came to an end, since it is now raining as I write this. Living 3 miles from the Elwha River Valley. I often frequent the Olympic National Park by just heading upriver. It has been my backpacking training grounds all winter. Wouldn't have it any other way. This week I walked on the bottom of old Lake Mills for the first time. Amazing the destructive power of water and man. Would've liked to seen it in its original state. Let me share a few favorite photos from the second half of the week. Old Driftwood. Held behind the dams for 100 years. Moon, N. Olympic Mountains & the Elwha. A beautiful coffee table book on the dam removal of this area - The Undammed Elwha River.